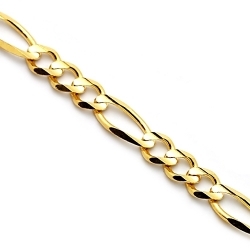 Figaro link chains are one of the timeless designs ever! 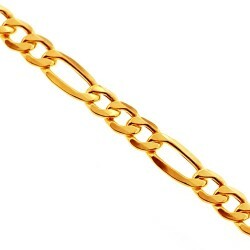 They are very special in their own way and made of different sized links that makes the final pattern one of a kind. The actual appearance of these necklaces makes them standing out from other types and once you see it on someone's neck you will recognize this type right away. 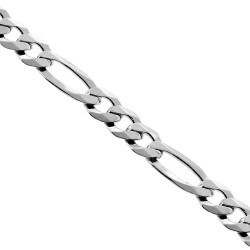 The standard figaro chain has a pattern of three smaller links, one larger link and then three smaller links. This repeats continuously across the entire chain. 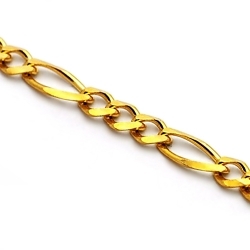 Some chains are made entirely of one metal, for example 14K yellow gold, while others consist of more than one type of gold, like repeating "blocks" of yellow, rose and white gold. 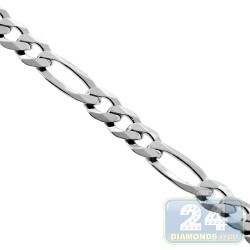 24diamonds.com has a stock of mens and womens figaro chains available in 10, 14k, two, three tone gold and 925 sterling silver. 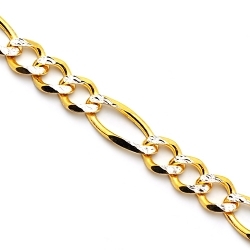 We also carry the chains with a fancy diamond cut effect which makes the piece looks like it is encrusted with real diamonds. These necklaces are great for everyday wear!